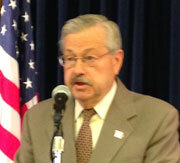 Governor Terry Branstad today said legislators knew he would likely veto the nearly $56 million they set aside for Iowa’s K-12 public schools. “My staff made it clear that was my position…it was made abundantly clear to them,” Branstad told reporters this morning during his weekly news conference. Branstad did approve a 1.25 percent increase in per pupil spending, but he rejected the additional money legislators voted to provide for the current school year. Branstad took action late Thursday on 14 bills that legislators passed, bills that outline a state spending plan for the next 12 months. School administrators say without that extra $55.7 million boost, many districts will have to make cuts, expand class sizes and either lay off staff or delay hiring. Some rural districts see the move as a back-door way to force cash-strapped districts to consolidate. Branstad said that’s “absolutely” not his intention. “But the only way that we’re going to be able to keep our smaller school districts vital and successful is if we’re able to attract young families that have children,” Branstad said. And the governor told reporters that’s one reason why he’s pushing to boost the Renewable Fuels Standard, since the ethanol industry is a boost to rural Iowa. On Friday, Branstad’s staff released a statement emphasizing the governor had approved $3 billion in spending on K-12 public schools. Today, Branstad emphasized he had approved additional money for the state’s relatively new teacher leadership and mentoring program and two-thirds of school districts will be splitting that new money. According to Branstad, the “turmoil” in Iowa’s public schools is primarily caused by the legislature’s failure to follow the law and approve the level of general state aid for schools by the legal deadline — which was February of last year.